We all remember the best footballer at school or university. How would we have reacted if he came to us one day and told us he wouldn't be at class next week because he was playing an international match? When student Ahmed Ahmedou told the University of Sussex he needed time off to play for Mauritania in a qualifying match for the 2015 Africa Cup of Nations, they needed some convincing. "The university thought I was joking at first; they wanted proof," said the 20-year-old left-back, who is studying for an engineering degree. "But then they realised it was true and helped me to rearrange my lectures." It begs the question: how has such a talented young player slipped through the worldwide scouting net? Ahmedou said: "I have lived nearly all of my life in Mauritania but the year before I came to England I was in France, playing football for Saint Etienne in the under-19 team, along with Kurt Zouma [who signed for Chelsea in a £12m deal in January]. "But my parents wanted me to study so I came to England because in Mauritania we don't have that many universities. "I have a lot of lectures and a lot of work but I wanted to keep playing football. So I found a club, Three Bridges [of Ryman Isthmian Football League south division], and I play for their under-21s. "It is the best choice for me at the moment to enable me to study and to play football. "I had offers to play for teams in League One and League Two but because they are professional clubs I could not sign and continue my studies. I am already halfway through my degree so it would be stupid to stop now." In the meantime, while he pores through his books, Ahmedou will try to help his country qualify for the Nations Cup for their first time in their history. It is a far cry from going home from studies and playing Fifa football on a games console at home. So how did it come about? "When the new Mauritania coach, Patrice Neveu, came in he sent an email to everyone who plays their football outside Mauritania - and at that time I was with Saint Etienne - so I replied to him and he was quite interested," Ahmedou said. "He gave me a trial and I was called up for the two matches against Canada in Valenica in September 2013, although I stayed on the bench for both. "In March this year I made my debut in a 1-1 draw against Niger, coming on for the last 15 minutes. It was magical. The first few minutes were a bit scary but once I got into the game I started to enjoy it." Ahmedou has been named in the squad for Mauritania's Nations Cup preliminary round qualifier first leg against Mauritius on Saturday. "I am confident that we can qualify for the Nations Cup," he said. "We have good players and a great coach. The fans are behind us. I don't see why we can't make it." Whatever the result, Ahmedou is certain to keep his feet on the ground. "I have been in England two years and I love it; it is a great country with great people. Well, the weather is not that nice, but I really like Brighton where I live. I have some great friends from uni and I live with some friends from home in Mauritania. "Hopefully I will be done with my studying in two years and then I will focus on my football. "I am still young; I still have time to play for a better club in a better league." Ahmedou knows it will not be easy - and his Three Bridges team-mates are quick to keep him in line. He said: "They tease me sometimes. 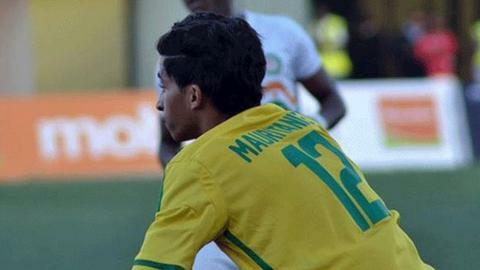 If I make a mistake in a game or training they'll say 'is that the Mauritania international player?' I'm used to that now."